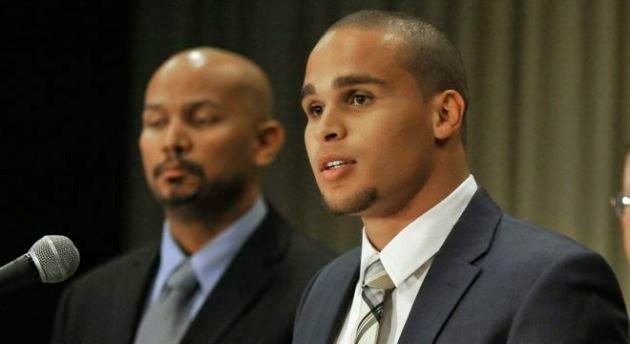 College Football Players Win Right to Unionize, What Does it Mean for College Sports? A regional director of the National Labor Relations Board ruled Tuesday that Northwestern football players could unionize. Does that mean some players will be able to organize and get better health care and academic support? Or does it spell the end of college sports as we know it? The AP takes a look at all sides of the issue. Question: Who came up with the idea of unionizing football players at Northwestern and why? Answer: Outgoing senior quarterback Kain Colter began the process by helping form the College Athletes Players Association, which is also affiliated with the National College Players Association, an advocacy group in California. Colter, who wanted to go into medicine but couldn’t because of the time he spent playing football, said the main thing he wanted was to make sure player medical needs were met, even after graduation. A: No, and there’s a chance they may not end up unionized at all in the end. The decision by the regional NLRB director is an important one for the athletes to have a chance to move forward, but Northwestern says it will appeal to the full NLRB in Washington, D.C., and there is no timeline on how long a decision from the board would take to come down. A: Northwestern, for now, though there surely will be copycat efforts at other private schools should the full NLRB uphold the ruling that the players can organize as a union. The NLRB does not govern labor matters at public institutions, but it’s hard to imagine there wouldn’t be wholesale changes at those schools, too, should the union be successful in bargaining for working conditions at Northwestern. A: No, though there are other developments in various lawsuits that might in the near future lead to increased stipends for college athletes. Former UCLA basketball star Ed O’Bannon’s antitrust lawsuit against the NCAA is due to go to trial on June 9 in California, and a win could change the way college athletics are governed. An effort by NCAA president Mark Emmert to add $2,000 stipends to the scholarships of athletes failed a few years ago because of opposition by smaller schools, but experts say they believe players in the major conferences will in the near future be paid beyond room and board. Q: If they’re not getting paid, what do the players want? “The key issue at Northwestern is negotiating better protections against concussions and improving medical coverage following graduation,” said United Steelworkers president Leo W. Gerard. A: Nothing at the moment, though anything that interferes with the organization’s model for so-called amateurism in college sports may eventually force some major changes in the way big time college sports are operated. Already there is talk in the major conferences on restructuring the NCAA and giving athletes a larger voice in their affairs. Big Ten commissioner Jim Delany said last month that a victory by the players would mean the NCAA would likely seek “guidance from Congress” on how college athletics should be governed. Combined with the antitrust lawsuits, there seems to be a gathering momentum for change that could alter the college sports landscape. A: Tons. Big-time college programs take in more than $100 million a year from basketball and football, and the big conferences are awash in cash from both television contracts and their own networks. The NCAA has a 14-year, $10.8 billion contract for the basketball tournament, while ESPN and the major conferences signed a 12-year deal for a new college football playoff package that is reportedly worth $7.2 billion. Northwestern’s football team generated $30.1 million in revenue last year, with $21.7 million in expenses, and those numbers pale in comparison in its own conference with powerhouses like Michigan and Ohio State.